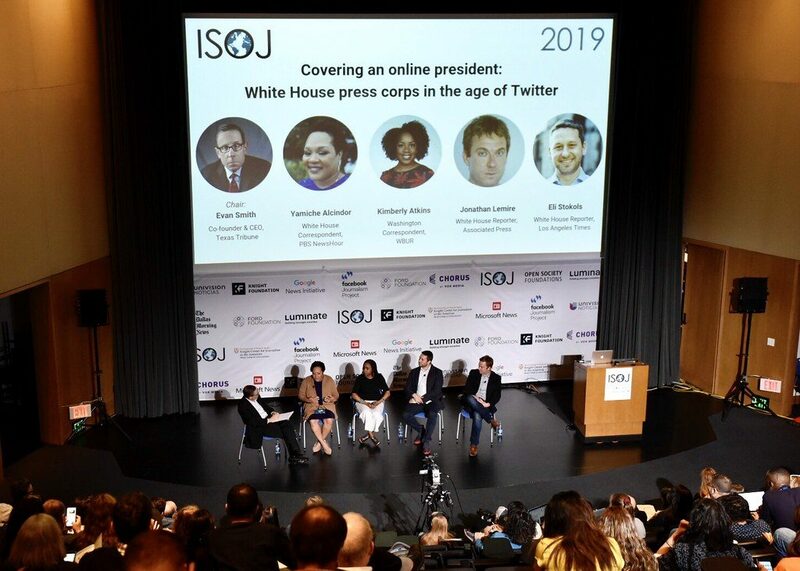 Four White House correspondents representing four media closed out the 20th annual International Symposium on Online Journalism (ISOJ) on April 13 with a discussion about covering the unpredictable nature of President Donald Trump in the Twitter age. Television reporter Yamiche Alcindor, from PBS NewsHour, was joined by Kimberly Atkins of WBUR, the Boston-based NPR station, Jonathan Lemire of Associated Press and Eli Stokols of the Los Angeles Times. As a first-time White House reporter, Stokols had the suspicion that what he would be doing with the Trump administration would be different from before. The complete lack of process makes people mostly unaware of what Trump is really going to do, he said. Atkins said the fundamental shift of covering politics now is that journalists cannot take information from the White House for granted, but instead journalists need to fact-check almost everything. The online president creates various challenges for journalists who work in television, radio, print and the wire services. Unlike print or wire journalists who can report in-depth, Alcindor said television reports on the updates of presidential tweets, though efficient, can lack context. On the other side, Lemire said the Twitter aspect echoes what a news wire service sticks to: moving fast and briefly. “The speed of this president, the way he changes the story so many times in a single, not just day but an hour” turns the news cycle into a “news minute.” In such a short time window, he added, merely reporting what Trump says can be misleading if context isn’t added. The vast changes in the political news reporting are driven not only by Trump’s presidency, but also the shifting landscape of the news industry as a whole, Atkins said. She noted that with enough time, budget and resources, reporters can get beyond the daily tweets and address the implications of the policies. Although White House briefings have become rare occurrences, “I believe briefings matter,” Alcindor said. “Set time, sit down, and have the American public hear the questions, watch the administration engage with media is important.” The briefings also give opportunities for journalists to ask questions and get things clearer, Alcindor added. Stokols commented that journalists’ constant fact-checking on Trump’s tweets inadvertently perpetuate the president’s constant claims that “the press is the enemy.” This makes fact-checking difficult because journalists need to be conscious of how this practice is being perceived and used.